CBDT has clarified that in the case of senior citizens, no TDS is required to be deducted u/s 194A, where the amount of such income doesn’t exceed Rs 50,000 in aggregate. It may be noted that earlier a deduction of Rs 10,000 in respect of interest income was provided to all taxpayers. Are you a senior citizen and your bank is still deducting TDS on your interest income which is less than Rs 50,000 in a financial year? Here’s good news for you. The Central Board of Direct Taxes has clarified that in the case of senior citizens, no TDS (tax deducted at source) is required to be ‘deducted at source’ u/s 194A of the Income Tax Act, where the amount of such income during a financial year doesn’t exceed Rs 50,000 in aggregate. In a circular, CBDT has said that it has been brought to its notice that in case of senior citizens, some TDS deductors and banks are deducting TDS despite the amount of income not exceeding Rs 50,000 in a financial year. “The same is not in accordance with the law as the Income-Tax Act provides that no tax deduction at source under section 194A shall be made in the case of Senior Citizens where the amount of such income or, the aggregate of the amounts of such income credited or paid during the financial year does not exceed Rs 50,000,” it said. The Tax Department further said that under sub-rule (5) of Rule 31A of the I-T Rules, 1962, the Director General of Income-tax (Systems) is authorized to specify the procedures, formats and standards for the purposes of furnishing and verification of the statements or claim for refund in Form 26B and shall be responsible for the day-to-day administration in relation to furnishing and verification of the statements or claim for refund in Form 26B in the manner so specified. It may be noted that earlier a deduction of Rs 10,000 in respect of interest income was provided to all taxpayers. However, to provide a dignified life to senior citizens, significant incentives were given to them in the Budget 2018-19 by FM Arun Jaitley. One such incentive was given in the form of exemption of interest income on deposits with banks and post offices up to Rs 50,000 without TDS under Section 194A. For this purpose, a new Section 80TTB was inserted in the I-T Act to provide deduction for interest income up to Rs 50,000. This benefit is also available on interest income from all FDs and recurring deposit schemes. Indians love gold and even the poorest Indian tries to acquire the smallest trinket that doubles up as jewellery and long-term savings. Naturally, television advertisements featuring movie superstars who tell you how easy it is to borrow money against that carefully accumulated gold, touch an emotional cord. Watching an Akshay Kumar slipping gold across the counter and getting a wad of cash back in a minute to finance a child’s education or to buy a tractor is so appealing that people across the economic spectrum look at gold loans as their first borrowing option, when they are in a tight spot. In almost every case, the gold that is pledged is not even a family heirloom of great emotional value and borrowers are clueless about the high interest they are forking out against an asset which fetches no return—one where although price appreciation has worked for Indians, over the decades, it is not guaranteed. 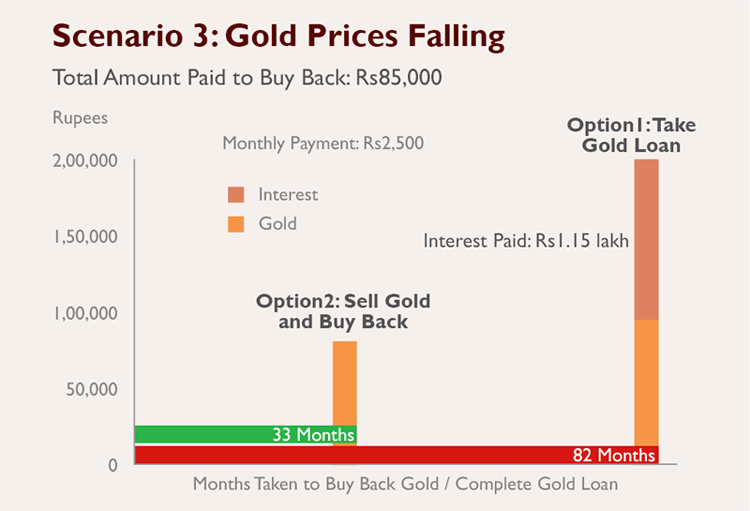 This emotional reaction and poor numeracy also makes lending against gold a very lucrative business. Allow us to explain why borrowing against gold is a mistake for most people, except those who own heirlooms of antique value far beyond the intrinsic value of gold in the jewellery. Borrowing against gold is attractive because few questions are asked. The lender does not ask you to disclose your income, produce a salary-slip or worry about your credit score or credit report. But think about it; why should the lender worry? It has your valuable gold in its possession and the actual loan disbursed is just 75% or less than the market value of gold. The lender is in trouble only if the gold price crashes by 30%+. But past data shows that a sudden crash in gold is a remote possibility, if not impossible, and when the price falls, lenders immediately begin to pressure the borrower to either pay back a part of the loan or bring more gold/jewellery as collateral. In most cases, only the interest is charged on a monthly basis, and the principal can be repaid at the end of the tenure to release the gold. The borrower can opt to repay both the interest and principal at the end of the tenure as well. However, the latter will prove to be costlier as the interest gets compounded. If a person defaults on interest payments, the penalty can be huge. Like every other loan, lenders may charge a processing fee, valuation charge, late payment penalty and pre-payment penalty, all of which add to the costs. Each lender has a different set of charges. Unlike equated monthly instalments (EMI), both repayment options involve pressure on the borrower to come up with a big chunk of money for repayment, to have the gold released. If you can, indeed, come up with such a sum, wouldn’t it be better to sell the gold and buy when you have the money? We will come to the arithmetic of this later. Most non-banking finance companies (NBFCs) claim that they offer a loan of 70%-75% of the market value of gold item. However, when we asked for the exact amount, we were told that only once they see the jewellery, they would be able to give the exact loan to value that can be availed. Even a RBI working group found that the borrower is generally not clear about the gold price used for valuing the ornaments. The RBI working group found that the format and content of documentation followed by each NBFC appear to be different, although each one of them claims to be giving a pawn ticket and loan agreement copy to the borrower. But when they spoke to complaining borrowers, they found that the pawn tickets do not contain the specific details of the jewels pawned, their weight in grams and the assessed value of the jewels. It does not contain complete details of the annualised rate of interest, maturity period of loan, details of auction procedure in case of default, any other charges, or the maturity period of the loan, etc. The procedure relating to auctioning of jewels is not transparently explained to the borrower. Even though the borrower is informed by the NBFCs about the auctioning of their jewels, the borrower is not informed where and when the jewels are auctioned. In one complaint received by RBI, the borrower was neither informed about the auctioning of his jewels nor called for repaying his loan. Above all, though the market value of ornaments in this case was much above the total dues outstanding, the difference on the sale of ornaments was not given to the borrower. But let’s us now come to the simple math of why borrowing against your gold makes little sense. When you borrow against gold jewellery, you are paying a very high interest as well as documentation, processing and valuation charges on an asset that you already own. Further, since people only borrow against gold in an extreme emergency, the chances of paying back within a year are low, which means that the interest mounts and the risk of default is also higher. 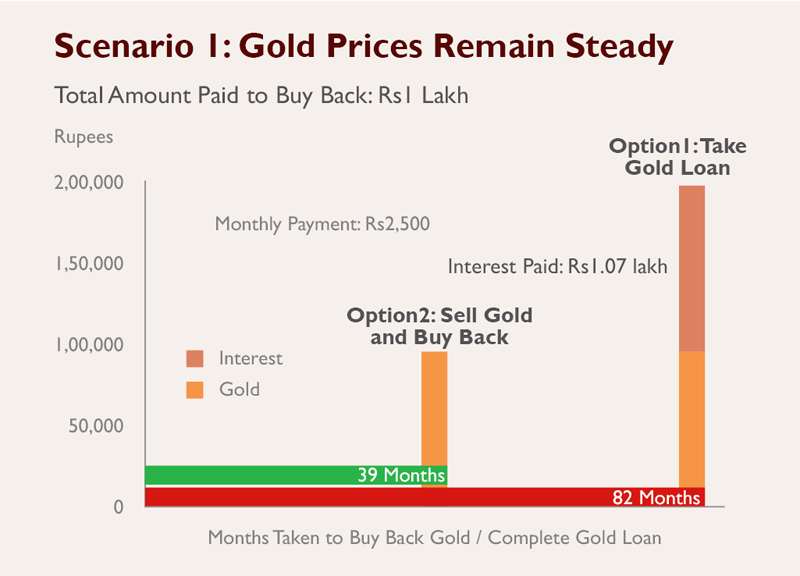 Let’s look at a few possible scenarios to check if taking a gold loan is worthwhile. We have based our study on the cost of a gold loan from Mannapuram Finance. We were told that the interest rate will be 2% per month(pm) and the loan-to-value (LTV) will be around 70%. There are tenures of maximum three months; hence, at the end of each quarterly period, if only the interest is paid, the loan can be extended for another three months. This can go on until the entire principal is paid back. However, as the contract is renewed every three months, the borrower may need to pledge additional gold, if the price of gold falls and does not meet the LTV criteria. Using the above information, let’s say Ramesh pledges 50gm of gold to avail a loan of Rs1 lakh at an interest of 2% per month. The market value of the gold is Rs1.44 lakh at the rate of Rs2,880/gm. Now let’s analyse what Ramesh will actually pay under different repayment options and when gold prices are rising or falling. We will then compare this to whether selling the gold and buying it back in small lots every month would have been a better option for Ramesh. 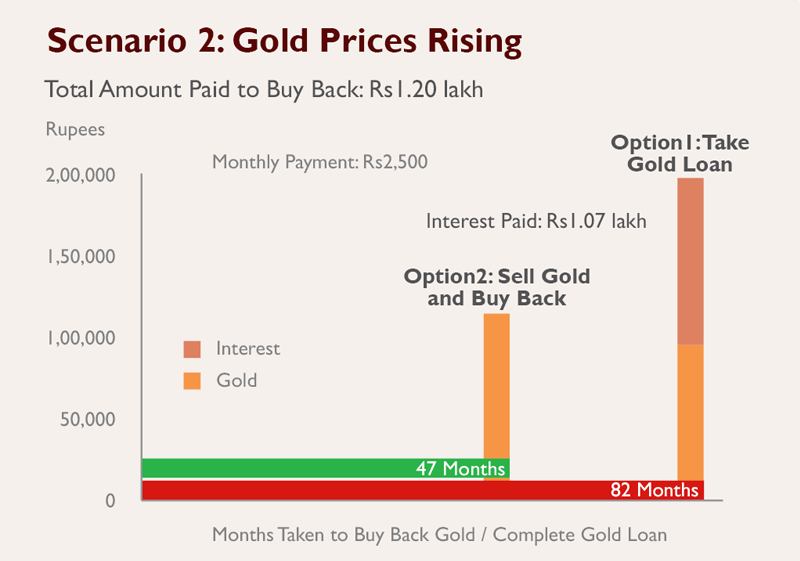 The interest on a gold loan of Rs1 lakh works out to Rs2,000 per month. We assume Ramesh is capable of repaying Rs3,000 every month which includes interest and principal. At this rate, it will take him almost 56 months, or five years, to pay up the money and get his gold back. If Ramesh chooses to reduce the monthly payment by Rs500 to Rs2,500, it would take him nearly seven years to pay back the loan. On the other hand, if he had chosen to sell the gold, instead of borrowing against it, he would have needed to sell only 35gm of gold to raise Rs1 lakh. Now, if he starts buying back gold worth Rs3,000 (equal to his repayment of principal plus interest in the above-mentioned scenario), he would have recovered his 35gm of gold in just 33 months or under three years. Even if he bought back gold worth just Rs2,500 every month, he would have his gold back in 39 months. And he would not have paid heavy interest and processing charges to a gold loan company. But one may argue that gold prices may not remain the same and they could rise sharply, making a loan option more attractive. Or, as has happened recently, gold prices could fall too. Let us look at what would happen to Ramesh’s borrowing under these two scenarios. Suppose Ramesh sold 35gm of gold (as mentioned above), but gold prices began to rise by say, 6%-10% every year. Even in this situation, if he buys gold worth Rs2,500-Rs3,000 every month, he would still be able to buyback the entire amount of gold in four years. If the gold price rises more sharply, at 12%pa, it will take Ramesh about 50 months (a little over four years) to buy back the gold. In effect, even when gold prices rise, it makes better sense to sell the gold you have and buy it back, rather than borrow against it. If Ramesh has pledged gold to raise Rs1 lakh and gold prices fall, then he could be in serious trouble. On the other hand, if he sold gold to raise emergency funds and is buying it back, he is a real winner. Consider what happens if Ramesh had borrowed against his gold. If the price of gold declines significantly, he will need to pledge additional gold to maintain the loan to value ratio or repay a chunk of the money. Our analysis shows that Ramesh will need to pledge additional gold only if gold prices decline by 15%-20% on an annual basis. Also, if the LTV increases, the financier can charge a higher interest. In the above scenario, a 12% decline in gold prices may not impact the value of gold pledged, if the amount repaid is Rs3,000 every month and includes a portion of the principal. However, Ramesh is capable of repaying only Rs2,500pm, with a very little part of the principal being repaid, he will need to increase the gold pledged amount by one gram at the end of the first year itself. By the end of the tenure, he would need to pledge an additional 3.25gm of gold, or pay a higher interest, in which case, his repayment period increases. There is a also a good chance that he will not be able to keep up with this high interest cycle and end up losing the gold altogether or end up in a payment-trap, if he wants the same gold back. On the other hand, if he had sold the gold and raised money and bought back even Rs2,500 worth of gold every month (using the money saved on interest), he would be able to buy more gold every month, as prices fall and get his gold back in less than three years. Clearly, liquidating gold to generate cash and buying it back at regular intervals is a much better option. It is foolish to pay a fat interest on an asset that you already own and take the risk of a penalty or losing the gold if you are unable to repay it in time. What is important is to avoid the emotional trap involved in wanting to retain the very same gold ornaments. Apart from a few gold ornaments, like a wedding or engagement ring, a mangalsutra, or a traditional piece of jewellery that has been handed down a few generations, there should be really no emotional attachment to an inert metal object. Also, most sensible women actually like to save carefully and make newer and better ornaments by melting down old ones. And many women also own jewellery that is gifted or handed down to them that they would be happy to sell and buy something new, contemporary and modern. It is far smarter to trade soppy sentimentality for good financial sense. So, the next time you hear of someone caught in a financial jam, tell them to switch off the gold loan advertisements and do some hard number-crunching. The RBI also found that a major proportion of the gold loan portfolio of NBFCs covers an average interest rate of 24%-26% and only 2% of their portfolio comprises loan at an interest rate of 12%. It is always said that the poor in India pay much more and the RBI report confirms this. It found that those in the unorganised sector pay 30%pa (per annum) and higher penalties and there was less transparency in the transactions. Even otherwise, the RBI report found that a majority of the gold loans are for borrowing of Rs30,000 to Rs50,000 and the quantity of gold pledged on an average is 40 grams. This really means that gold loan companies are thriving because Indians in the lower income groups are rushing to borrow against gold without understanding how much they are paying out, or exploring more sensible options. In most cases, you will find that they are carried away by advertisements featuring mega film stars and none of the advertisements breathes a word about risk factors such as high penalty clauses or transparency in interest charges. The RBI, as the regulator of gold loan companies, ought to have insisted on this, like the capital market regulator does with mutual funds. As we said earlier, a gold loan requires the borrower to estimate her ability to pay interest, fees and charges and then a lump-sum to release the gold. But when borrowers are unable to work out the ridiculously high cost of borrowing against a valuable asset that they already own, what is the chance that they will accurately estimate their ability to repay the loan? If a borrower is unable to repay the loan, the lender gets possession of it. How Popular Are Gold Loans? India is a gold-loving nation and accounts for about 10% of the total world gold stock. Of this, rural India accounts for nearly 65% of gold owned, probably because it is seen as the safest asset. Most people have an emotional attachment to gold and will not sell it except in times of extreme financial distress. This is what makes gold loans such an attractive business for lenders. While the unorganised sector accounts for 75% of gold loans, the remaining 25% of the market, with organised sector institutions and banks, is also growing rapidly. According to the World Gold Council, out of the national gold stock of around 22,000 tonnes, about 600 tonnes is monetised through loans because they are easy to obtain and processed within hours, if not minutes, as claimed by the advertisements. It is clearly time to be less emotional and more sensible about gold. In today’s uncertain job market, a lay-off can lead to months of unemployment. A serious illness or disability due to accident can also hamper one’s ability to earn for a prolonged period. When life throws nasty financial surprises your way, have a Plan B ready. An adequate emergency fund can help you tide over the crisis. To a great extent, credit cards have done away with the need for emergency funds. You can use them to tide over the emergency till you are able to arrange funds. But credit cards should not be seen as a replacement for setting up an emergency fund. Financial planners usually suggest keeping aside six month worth of expenses for emergencies. However, this thumb rule varies according to individual circumstances. If you have health insurance, you won’t need a contingency fund during a medical emergency. However, be prepared for situations where you or a family member might not need hospitalisation, but will need cash for doctor visits, tests and medicines. The size of the contingency fund will also depend on how secure your job is and how many earning members are there in a family. 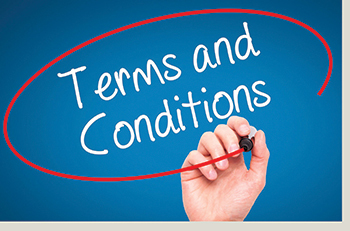 You also need to take into account EMIs and insurance premiums that need to be serviced. Households that are paying huge EMIs experience financial stress when income reduces. Their emergency fund has to be that much bigger. “An emergency fund goes a long way in servicing debt while alternatives like restructuring the outstanding loan is being worked out,” says Gaurav Roy, Head, Products at BigDecisions.com. After you figure out how big a kitty you need, you need to choose an appropriate investment option for the fund. Remember, returns are not important here. What is more critical is that the money should be easily accessible at short notice. Financial planner Malhar Majumder suggests parking at least 25% of the emergency fund in a savings bank account. You can withdraw it 24×7 (see box). Ensure you have a debit card with adequate cash withdrawal limit. Many people remain unaware of their debit card’s daily cash withdrawal limit till the time they attempt to withdraw huge amounts of cash during an emergency. But savings bank accounts give very low interest of 4% on the balance. A better idea is to go for a sweep-in account where excess funds are automatically transferred into a fixed deposit and earn higher returns of 7-8%. When you withdraw, the money is paid by breaking the fixed deposit. If your bank does not have a sweep-in facility, you can put the money in a fixed deposit that can be broken anytime. The other reasonably comfortable option is to park your cash in liquid funds, says Majumder. The money will earn a decent return and can be withdrawn at any time. Liquid funds have returned 8.24% over the last one year and ultra-short term funds have returned 8.52% during the same period. Redemption takes a day. Some fund houses offer liquid funds that come with ATM cards so the investor can withdraw the money directly without the redemption first going to his bank account. Revisit your kitty A contingency kitty once formed is not the end of the process of providing for a rainy day. You need to revisit the fund and replenish it regularly to adjust for inflation, lifestyle changes, increase in family members and changes in debt commitments. The kitty should be reviewed at least once a year. He has introduced Aparnna to the basics of banking and encouraged her to learn about financial concepts and investment products. Two years ago, she topped the South zone in the National Financial Literacy Assessment Test (NFLAT). The exam is conducted by the National Institute of Securities Market (NISM) for students of Classes VIII to X and tests basic financial awareness. Now 15, she already knows about the different types of insurance covers and how mutual funds work. “Knowledge of financial concepts is necessary to succeed in the real world. It is perhaps the best gift you can give to your child,” says her father Rajendra Chaudhari. – Manages her own bank account but has not yet started investing. 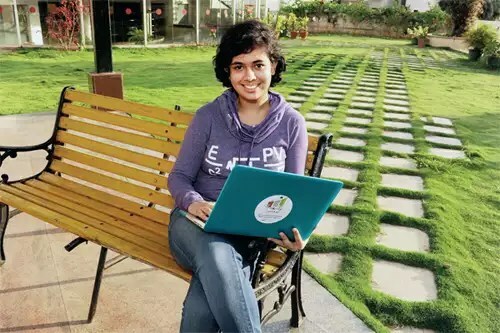 – Knowledge of finance came handy when she co-founded a company that makes eco-friendly water sprinklers.